Camp with the YB's at Wilgus State Park in Ascutney Vermont! Its that time again! The 2019 season kicks off with our favorite spring campout. Bring your sleeping bag, a sweater and a warm hat. Ride twisties, hang out around the bonfire, check out new roads and make new friends. There is a a mix of lean-tos, Connecticut River-facing camp sites, and a few cabins (first come-first serve) Firewood is available on site, and there is a store and butcher shop nearby. Hot coffee every morning but you MUST bring your own cup.You can bring your own dinner to cook over the campfire, and as usual Ken will be once again prepare an Italian pasta dinner friday night for everyone to enjoy. "Spagetti by Springhetti".. Feel free to bring bread, cheese, sausage, venison etc to share. Its a great way to ge to know the YB's. There is a communal fire area, and each site has fire pit with a grill over it. It is one of the better facilities in the Vermont Park System for campfire chefs! We have been doing this event for years now and it is always a mix of weather and always fun. Invite your friends, bring your guitar or harmonica or spoons and jam out, hike the Long Trail, ride to an art gallery or go off road. The best roads in Vermont arent paved. Year after year this is one of the best attended campouts. All bikes and riders will find something to enjoy. Please no loud pipes. Folks often will gather at the coffee pot / campfire as soon as the sun comes up (or earlier) and plan rides to eat. While this is spring camping, typically the weather during the day is quite warm. Typical overnight temps get close to, but rarely below freezing. If you would like to reserve a cabin, please contact the rally chairs. Cabins are first-come, first serve and sleep 4-6 people. They are not heated, but have electricity. 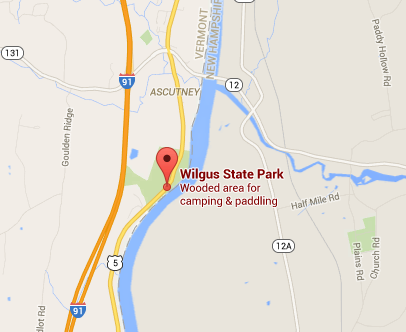 Wilgus State Park is located on Rt 5 in Vermont. It is very close to Mt Ascutney. It is nearby the Brownsville Country Store, which is a great little place to eat. There are lots of great twisty roads, miles of awesome dirt roads, and great hiking trails to explore. Other nearby ride-to-eat destinations include the Long Trail Brewery, Harpoon, Prohibition Pig, and several other great brew-pubs. Fee is $25. Mail check to Yankee Beemers, P.O. Box 2151 Fitchburg, MA 01420, re: Frosty Nutz, or via PayPal at www.yankeebeemers.org. Your hosts are Bill Cusack (bcusack@comcast.net) Duncan Cooper, and Ken Springhetti (kz1000@hotmail.com). Feel free to contact us for more information or general camping advice.